We love love love pasta in this house! And chicken. So we eat this a LOT! It's doesn't take too long to make either so it's great for us after school. We have some version of chicken and pasta pretty much every week. 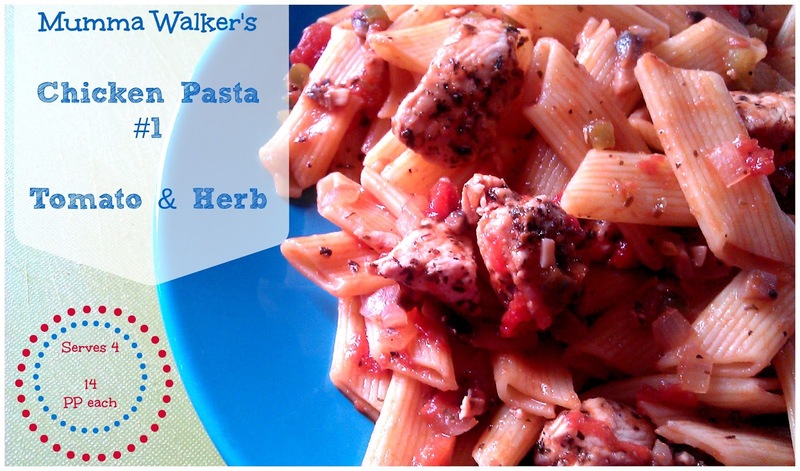 This is this weeks Chicken Pasta, the tomato version. I claim it feeds 4 although I split it between the 5 of us... the three boys split two adult portions between them. You can reduce the points on this meal by cutting down the amount of pasta you use. I admit we use 500g because that's the size of the bag we get from Asda which is suggested to serve 4. It does seem like a lot! But 250g never feels like enough. Put the oil in a mixing bowl and add the garlic powder and herbs. Blend together and then add the diced chicken. Coat the chicken in the herby oil. Heat a pan and then add the chicken, brown on each side then turn the heat down and add the onion and peppers. Fry until softened, then add the mushrooms. When all the vegetables have softened stir in the tomatoes and start to reduce. Add the pasta to some boiling salted water and simmer. As the tomato sauce thickens sprinkle in the sugar and add the ketchup. Add salt and pepper to taste. Drain the pasta and serve with the chicken & sauce. Personally I like to add the pasta to the sauce and give it a good mix up because then the kids are more likely to eat the veggies in it, but that's up to you!